Clothbound cheddar is synonymous with the southwest of England, with the Somerset and Devon regions producing some of the world’s most beloved wheels. 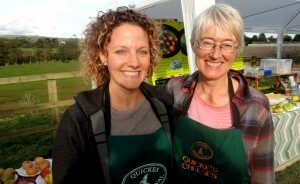 Among the prominent English cheddar makers is Mary Quicke (Mrs. Quicke’s Cheddar), a fourteenth generation farmer at the helm of her family’s 1500-acre dairy farm, Quicke’s Traditional, in the heart of Devonshire. Born and raised amidst a patchwork of lush rolling hills and rich, red fields, Mary’s path to farming and cheesemaking is as nuanced and bold as her line-up of award-winning cheeses. For over 450 years, the Quickes have been farming in Newton St. Cyres, a small town complete with thatched roof cottages and two lively local pubs churning out thick cuts of cheddar and chutney. Mary’s father, Sir John Quicke, is credited with the revival of cheesemaking to the family’s repertoire. In the 1970s, he set out to make nothing short of spectacular cheddar, prioritizing healthy pasture to ensure the highest quality milk. Sir John impressed upon each of his six children a profound commitment to the preservation of landscape. He gave them all surf lessons, too. By the time Mary was 12, she was catching waves with her father, reveling in beauty of Devon’s two coastlines. Though Mary takes after her father in height (extraordinarily tall) and wit (razor sharp and sassy), she didn’t follow in his farming footsteps right away. She left Devon in pursuit of education, ending up in London. It was at the age of 29, near the end of a Ph.D in literature, that Devon and the farm called her home. Mary dragged her husband Tom, a London man born and bred, kicking and screaming, insisting that she be the one to step in and help her father in his old age. To ensure the farm would be in capable hands, Mary worked in a farmhouse creamery in Shropshire, England for a year, before taking full reign of the family farming operations. Tom eventually settled into his new rural surroundings and applied his skill set in renewable energy and sustainability to the farming practices and infrastructure at Quicke’s Traditional. Today traditional clothbound cheddar, aged up to 24-months, as well as Red Leicester, Double Gloucester, goat’s milk cheddar, whey butter, and ice cream are made by a team of Quicke’s Traditional cheesemakers. A grass-fed herd of 500 cross-bred Holstein, Ayrshire, and Montbeliarde cows dot the expansive pastureland. Due to the temperate climate in Devon, grazing is possible almost year-round. 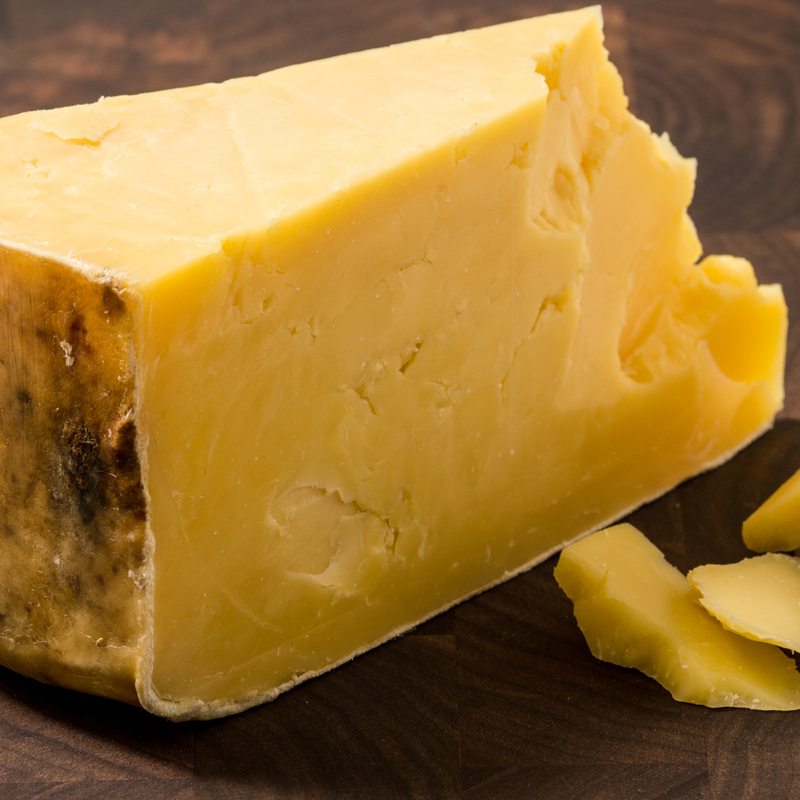 Quicke’s cheddar is made using a traditional recipe. Around 4:30am, after milk from the previous day’s milkings is pumped into large stainless steel vats, starter culture is added to increase the acidity. 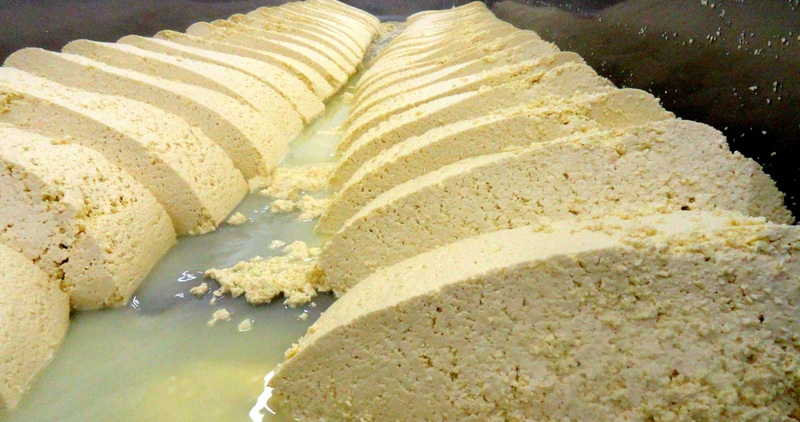 Rennet follows, and once the curds are cut to the desired size, they are moved into a cooler tank where whey is drained off. 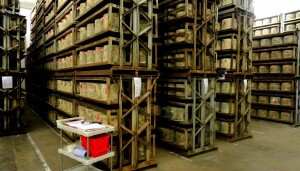 The curds are then molded into bread loaf size strips and turned repeatedly until a specific (higher) pH is attained and more whey is able to drain. This is the “cheddaring” process in action. The curd is flattened into mats through repeated turning and then run through a peg mill to break it up into uniform chunks. Once salted and mixed through, the curd is pressed into muslin lined molds, where is it pressed and turned daily for the next three days. On the morning of the third day, each wheel is removed from the mold and brined. Fresh muslin cloths are then wrapped around each new wheel and sealed with lard. 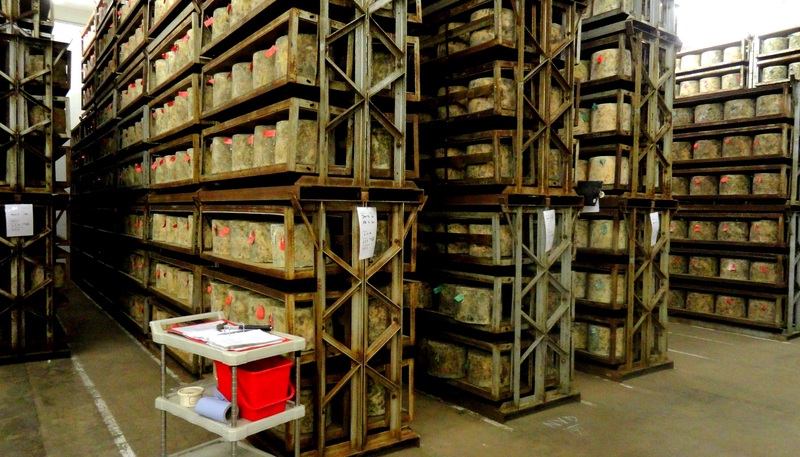 The cheese ripens on wooden shelves and is turned daily for the first few months to ensure even maturation. Natural molds soon begin to populate the cloth, forming a mottled rind. The result of months – and years – of aging is a dense, earthy, crumbly cheddar with hints of lemon and fresh grass. 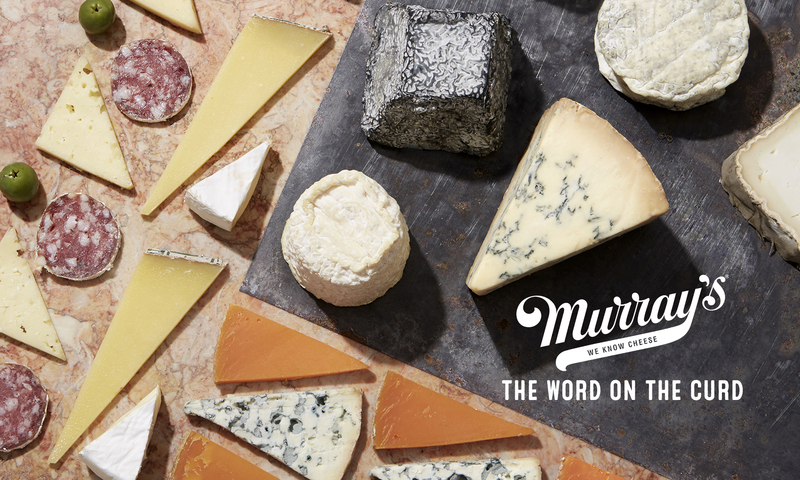 When Mary isn’t tasting through batches of cheddar in the on-site aging rooms, she’s busy promoting her cheese and judging competitions around the globe. Her morning walk through the woodlands surrounding the farm is one of her favorite pastimes and a true expression of Devon’s terroir. Surfing is still high on her priority list, too. 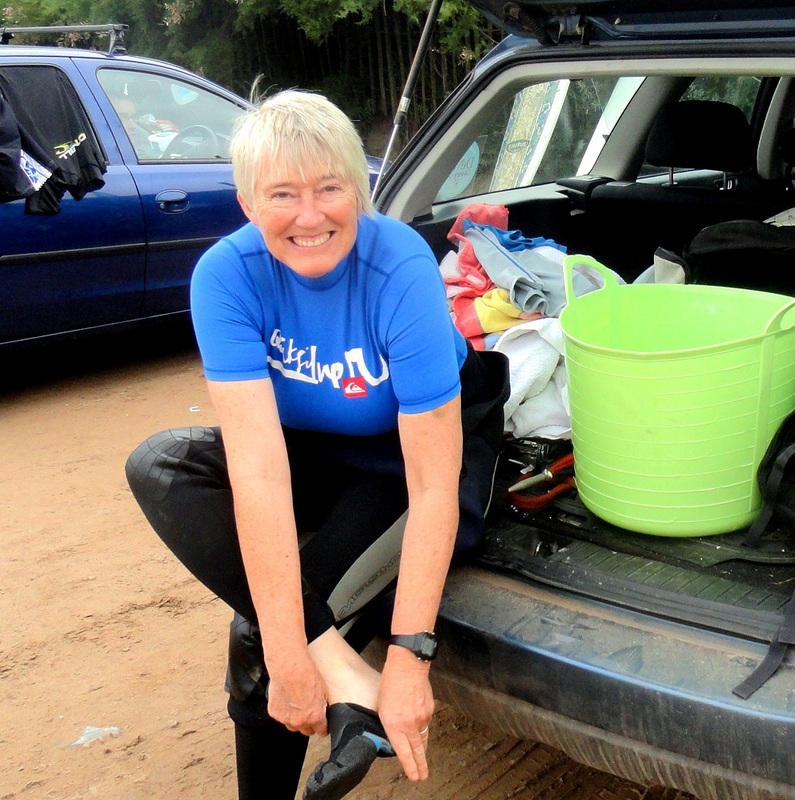 At the age of 59, a great surfing session followed by a hunk of vintage cheddar is Mary Quicke’s ideal Devonshire afternoon.